Connecting a corrupted Flash stick, accessing a website that includes a Trojan or a rogue or downloading malware from email attachments, are just a few examples of how your computer can get infected. ZHPDiag is a software that allows to perform quick and complete operating system diagnosis. It scrutinizes the Base of registers and lists the sensitive areas that are likely to be pirated. It is based on a whitelist by module system that allows for shorter reports. It detects a large number of malware. It serves as monitor for the most common infections. At the end of report, a list of detection returns to profiles of the malware. No installation id required to use this tool. ZHPDiag is a lightweight application designed to help you perform a comprehensive analysis of your system and detect Trojans, viruses, adware, PUP and other types of malware. The program does not need an installation per se, but rather you need to agree to the terms and conditions to run it on your computer. Since the operation creates a shortcut on your desktop, the next you can access it from there the next time you need to run it. The interface is simplistic and user-friendly, so it is unlikely to give you any troubles. Although the splash screen features a Repair button, you should bear in mind that the main function of the utility is to scan your computer and provide you with a report on the potential infections that are plaguing your system. 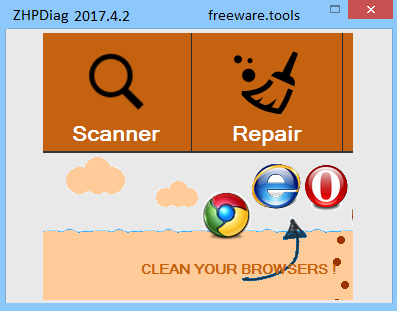 Following the scan, the program provides you a summary of the adware, unnecessary toolbars, malware and other potentially unwanted programs that are found on your computer. Afterwards, you can take the necessary actions and use third-party cleaning or antivirus software solutions to clean your computer. Then again, the highlight of the application stems from the fact that it provides a detailed report on the scanned areas, components, registry keys, user profiles and other protocols that it investigates. The report is available in a plain text and includes the paths to the files that are explored. While it may not have the capability to clean then, at least you can access the directories where they are stored and keep a close eye on these sensitive areas that can be potential gateways for malware. In the eventuality that you want to confirm or determine that malware is behind your computer's strange behavior, then perhaps ZHPDiag could lend you a hand.